“At the first, he got banged into, and I thought all chances had gone,” Quinlan told BBC Sport. “It was just fear keeping me on – I was hanging out of the back door and praying to God that he’d keep me on. He travelled superbly – he’s just jumped and travelled – he’s very tough, especially for a veteran. This was something of a story-book win for Sean Quinlan. 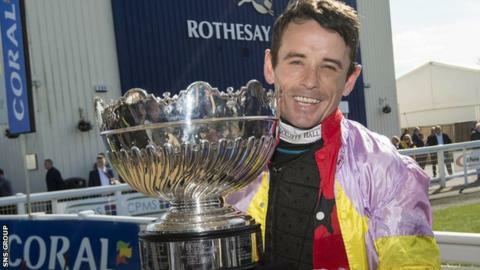 Once renowned as one of the ‘wild men’ of the jockeys’ changing room, he once found himself in court after a pub fight, but no one ever doubted his talents. With the support of friends, agent Richard Hale, and his own efforts, he’s worked his way into a position where he’s something of a go-to rider on jump racing’s ‘northern’ circuit.